When students need to conduct research they are often at a loss for where to find the information that they need. Whether you are hoping to fully stock your children with their own reference library, help them with library research or even direct them to web resources, there are a variety of reference options that will make your task a little easier. An almanac is a great secondary source of basic information. Almanacs are published every year (annually) and contain current statistical data. These statistics are often presented in lists, charts and tables. Atlases are books of maps. Atlases supply geographical information that may be current (and are therefore primary sources) or historical (secondary sources). Atlases often use special symbols to convey information, so check the legend or any other area where the symbols are explained. Audio recordings may be in cassette, CD or even MP3 format. These recordings may be books or poetry on tape, recordings of speeches, interviews, testimonies or other spoken events, or recordings of dramatic performances or music. Audio recordings other than non-fiction books on tape are often primary sources. Dictionaries are books of words that give spellings, definitions, and pronunciations. Dictionaries may tell you the syllables of a word, and its part of speech, as well as using the word in a sentence. Dictionaries may be abridged (only commonly used words) or unabridged (every word in the language). Dictionaries may also be specialised. 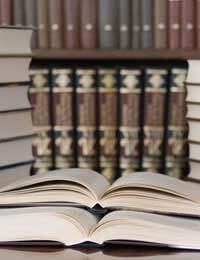 Biographical dictionaries, geographical dictionaries and foreign language dictionaries are common types of specialised dictionaries. Dictionaries are secondary sources. An encyclopaedia is usually a set of books that contain information about a great number of subjects. Each book in the encyclopaedia (volumes) is arranged alphabetically. People, places, things, and events are common topics within encyclopaedias, and entries often have accompanying maps, drawings or charts. Specialised encyclopaedias, covering just one specific subject, also exist. Encyclopaedias are secondary sources. A film is an audio and visual recording which may be in video or DVD format. Films may be based on books, original screenplays, documentary evidence or real life footage. Films based on books are called adaptations, and may not always be true to the original and are secondary sources. Films made from original screenplays are new works of fiction and are primary sources. Films based on documentary evidence are presentations of research regarding a person or event and are secondary sources. Films based on real life footage are themselves witnesses to an event and are primary sources. A journal is a scholarly periodical, sometimes also called a serial, containing information researched and written by experts in a particular field. Use a journal when you need current, scholarly information on a subject. Journals are written and edited by experts, so the information in them is highly reliable. Be aware, however, that many ideas published in journals are cutting-edge, so that will mean that not everyone will accept them without further proof. Literary criticisms are studies of the writings of a particular author. Literary criticisms are not written by the author of the work in question, but are usually written by other academics. Literary criticisms analyse and judge works of literature, but not always according to the same standards. Literary criticisms may also compare two or more works of literature. Literary criticisms are secondary sources. A newspaper is a daily or weekly publication that will contain breaking news, human interest articles, opinions and editorials, and advertisements. Obituaries (death notices), wedding announcements, the weather, social announcements and comic strips may also be printed in a newspaper. Newspapers may be local or global. Newspaper articles published at the time of the event are primary sources. Newspaper articles published after the time of the event, and reflecting on the event, are secondary sources.